SAP is a great software. One needs to fully understand its features in order to effectively exploit them for the benefit of customers. 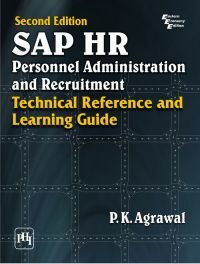 Mr. Agrawal's books on SAP HR have a unique approach. A chapter usually focuses on a single business concept, and discusses the user interface as well as its associated configuration. This logical division makes it easier for readers to understand the functionality. Another important feature of these books is the level of detail. Each screen and each field in a screen is explained. Explanation includes meaning, use case and in some cases guidelines. Details are balanced by overviews explaining the concepts and their relationships. While explaining functionality, Mr. Agrawal has made efforts to highlight what can be done and how it is to be done. This is particularly important for less experienced users and consultants. Indicating chapter numbers against each menu and configuration item is a very useful innovation, as it establishes direct link between the SAP system and the book. Another useful feature is that these books can be read not only by consultants, but also by users, business process owners and even by senior managers. The importance of each topic for each category of users is specified. Mr. Agrawal has taken considerable pains in writing these books, and I congratulate Mr. Agrawal on his achievement and thank him for his contribution to the SAP community. P. K. AGRAWAL was a Program Manager at Tata Technologies Limited, Pune. He received his Bachelor's degree in Mechanical Engineering from Indian Institute of Technology Kharagpur, and his Postgraduate Diploma in Industrial Engineering from NITIE, Mumbai. He has over 31 years of experience in several areas of Industrial Engineering and Information Technology. He is a certified SAP consultant in SAP HR with 8 years experience. He also does consulting and teaching in SAP HR. He may be contacted at 09822847682 or agrawal.prem@gmail.com He has several publications to his credit including two papers each in International Journal of Production Research and European Journal of Operational Research.